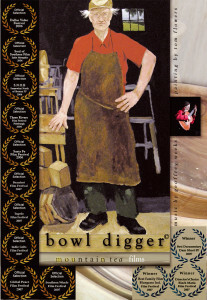 Bowl Digger Preview from Kristy Higby on Vimeo. 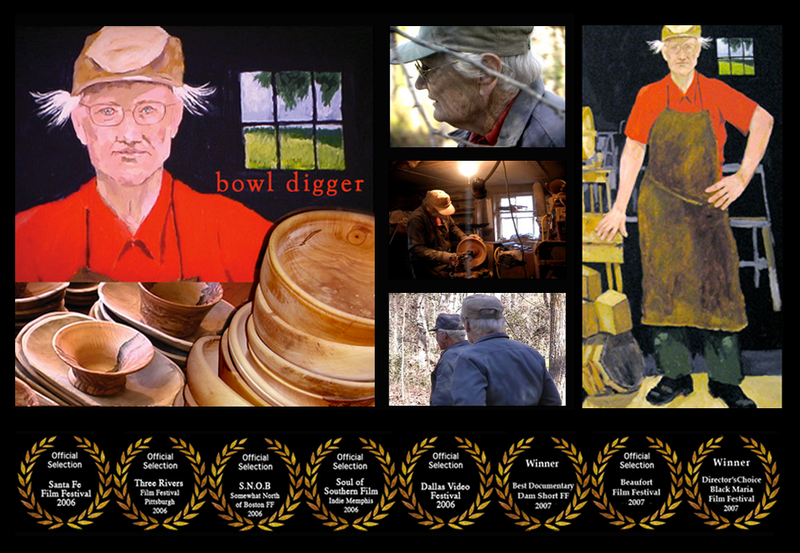 A loving story of octogenarians Maxie Eades and husband Hilton, rural South Carolinians who create wooden bowls and dough trays as durable as their creators. We experience the couple’s strong character through their own words as the entire process is depicted from felling the trees to turning and carving the bowls. Her creations are the result of her “still a’turnin” philosophy. Her life continues to move in a circular motion. The concentric cycles of her life (both creative and natural) embrace love of nature, craft and partner providing a moving portrait of a life well-lived and well-loved. The intrigue for me is Maxie’s candid and outspoken personality as she talks about her love of working with her hands, turning wood, her need to fix things and the fun she has making ‘pretty bowls.’ As an 88 year old woman with a 7th grade education, she speaks in a universal way about the creative process and the intrinsic rewards of making unique objects out of wood. Her love of tools and materials will be familiar to most artists and craftspeople. Her straight-forward problem-solving drive combined with a non-stop work ethic contributed to her successful career as a machinist and fixer in a textile mill. She was also influenced by her father’s career in the sawmill and her mother’s dedication and sacrifice in raising 16 children. This career helped her launch a second career as a ‘bowl digger.’ As she puts it, ‘I like to fix things that can’t be fixed and I like to see wheels turning… and I’m still a-turnin.’ After fashioning a hand-made lathe using a motor from an old washing machine with help from her husband, Hilton, and making hand tools from the hard steel found in buggy springs, she taught herself the craft of wood turning. Another focus of the story is the relationship between Maxie and Hilton as demonstrated through their synchronized ‘dance with chainsaws,’ their twin-like appearance, their intuitive working rhythms and like-minded purpose in their marriage of 55 years. At age 88 Maxie can haul and shape dozens of 50lb logs into two-foot dough trays and turned wooden bowls in a season that starts with felling trees on the first full moon in December. The story follows this laborious process to it’s conclusion where she sells her wares for a token price to people who take the time to find her… and her living room full of stacked and finished bowls.